I know it has been years since I have used my blog page here at WordPress. But This seems like the best place to get my thoughts down concerning some upcoming changes to Black Bear Forge and the way I accept and process orders. For years I have had a website with a simple shopping cart system that allowed people to order and pay upfront for a variety of items. Those orders would then go into the queue and hopefully be completed and shipped in a timely manner. While this works and allows the customer to secure their place in the queue, it has become a very burdensome way of doing business. It was great when I had 10 – 20 orders in the queue and lead times of about 4 weeks. But as more and more people started buying my products the list grew faster than I could keep up. At one point I had nearly 100 prepaid orders pending in the queue. Thats a lot of people with lots of expectations on receiving their order in a timely manner. When you factor in the little things that life brings your way to keep you out of the shop, things like injuries, bad weather, family vacations and so on. the wait times can not only be long, but also extremely difficult to predict accurately. Currently working a 60 plus hour work week, I anticipate lead times of about 16 weeks. So the time has come to put the brakes on an regain control and hopefully a more sane approach to doing business and taking orders. In the next month or so i will start the process of removing the ordering option form the items listed on my web site. This is also to prepare for a completely new and revised web site. Once all of the options for ordering and prepaying for items is gone from the web site I will concentrate on the current backlog of orders. With no new orders being accepted I hope the backlog will start to clear out in a more timely manner. Once things are back under control I plan to use a slightly different approach to making items for sale. Instead of accepting an endless number of paid in full orders I will make items for sale so that if you pay for the listed item it is available and ready to ship. To facilitate that system I am looking at simply using my Etsy shop at: http://www.blackbearforge.etsy.com This will make my life and the listing of things for sale much simpler since Etsy is designed just for this purpose. But I know that some people will miss out on limited production runs or one of a kind items unless they just happen to look at the shop at the right time. So with that in mind I will also be starting an unpaid waiting list. I will add names to the list with no deposit. The list is not an obligation to buy nor does it guarantee I will make a given item when I get to your name on the list (so if you get on the list hoping for a sword or a driveway gate, you’re still going to be out of luck). As the time allows between stocking the Etsy shop, building stock for shows and trying to live a life outside the shop, I will slowly take a few names on the list. At that time we will discuss your project quote a price and accept a deposit with full payment due on completion. I hope this all makes some sort of sense. I also hope that it allows me the freedom both in the shop to make what I am inspired and excited about making at any given time. But also the freedom to live life without feeling like I cannot enjoy a day off because the list keeps getting longer an longer by the day. After all we have been building our home for 10 years and I haven’t done a full weeks work in the last two years due to the overwhelming amount of work in the shop. Thank you for everyone who has been supporting Black Bear Forge. I won’t be going anywhere, just destressing the process a bit. This entry was posted in Blacksmith shop, Custom work, Uncategorized, Web site updates on April 4, 2018 by John Switzer. This entry was posted in Custom work, Hardware on January 23, 2015 by John Switzer. Boy, have I been bad about writing this blog. I don’t think any of the great bloggers have any competition from me. Anyway, Today I finished up a few planing stops or bench stops, I’ve also seen them called bench hooks. 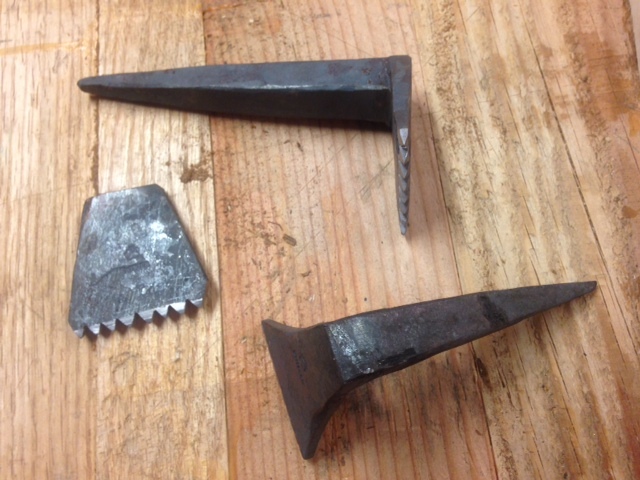 These are a small fishtail shaped iron hook that had teeth filed into it. Typically these are set into a wooden square 2″ – 3″ that is mortised through the bench top. This allows the iron hook to move up or down to adjust to the board thickness. These are a real improvement to most hand tool workbenches. 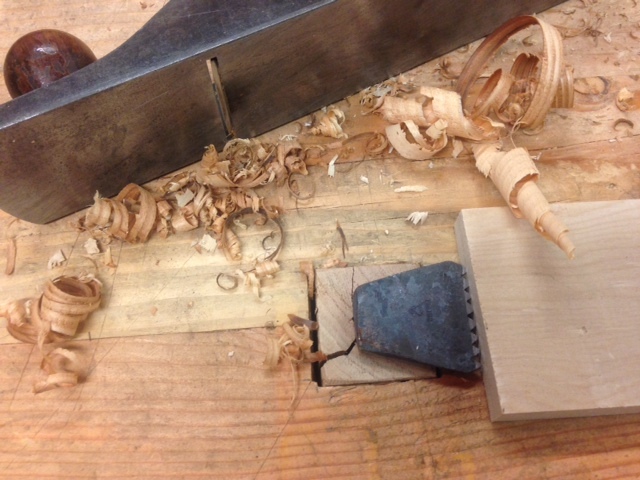 Three planing stops ready to be put to work. When you cut the hole in the wooden part of the stop, just make sure it is a good fit so you don’t cause a split like i did. Here is the bench stop inserted into the wooden planing stop. This entry was posted in Custom work, Tools, Wood shop, Workbench on March 7, 2014 by John Switzer. A few weeks ago a friend was commenting on a TV show he had seen where someone took what he thought was an old style soldering iron, and used it to warm his cup of coffee. 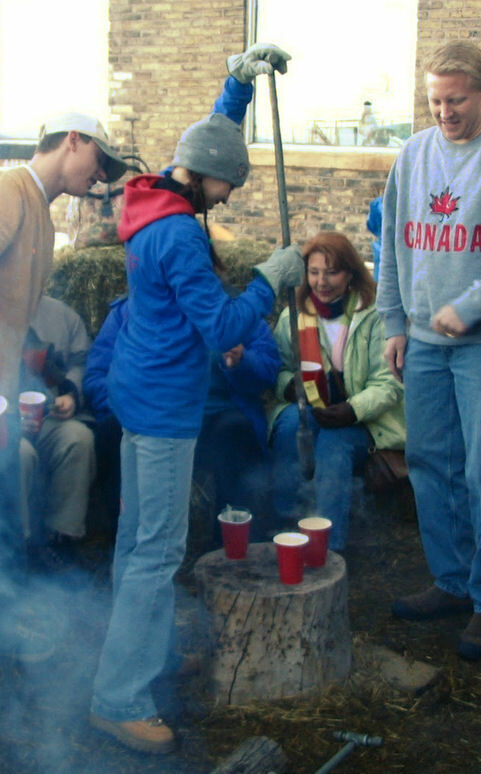 While I have never actually seen this done, I have heard of a “flip iron” being used to make a hot toddy or hot buttered rum. I felt pretty smug knowing what he was refering to. Now I really should learn from the way the old timers did things. It would save me lots of grief. But not me, I have a 100 pound power hammer. 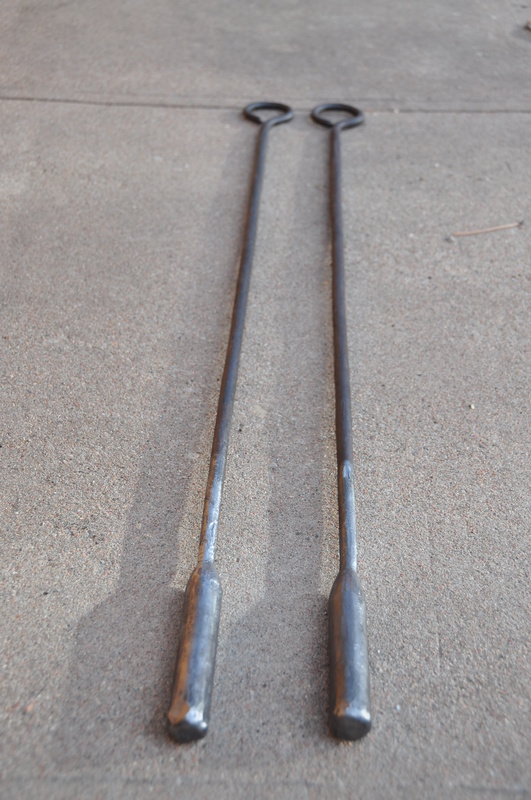 So why not just make these from a single piece of 1″ round bar? 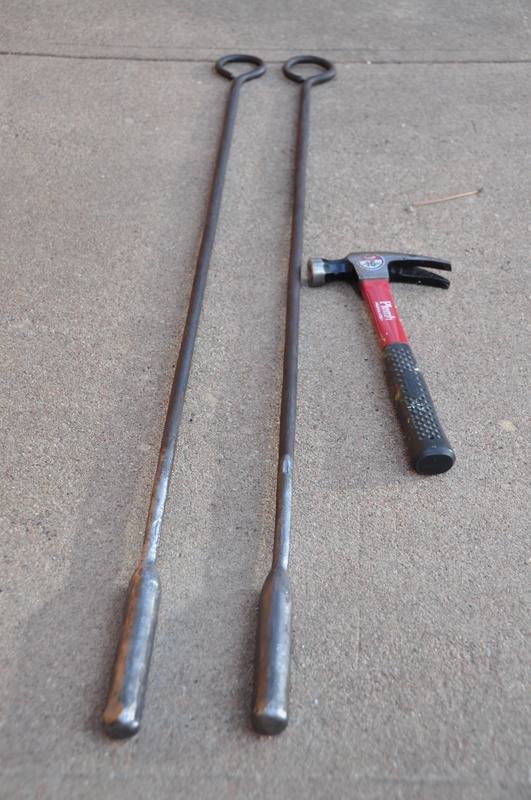 Even under the hammer drawing 10″ of 1″ bar into 40″ of 1/2″ bar is a lot of work. I suspect that this took about 3 times longer than the alternate and probably more traditional approach. 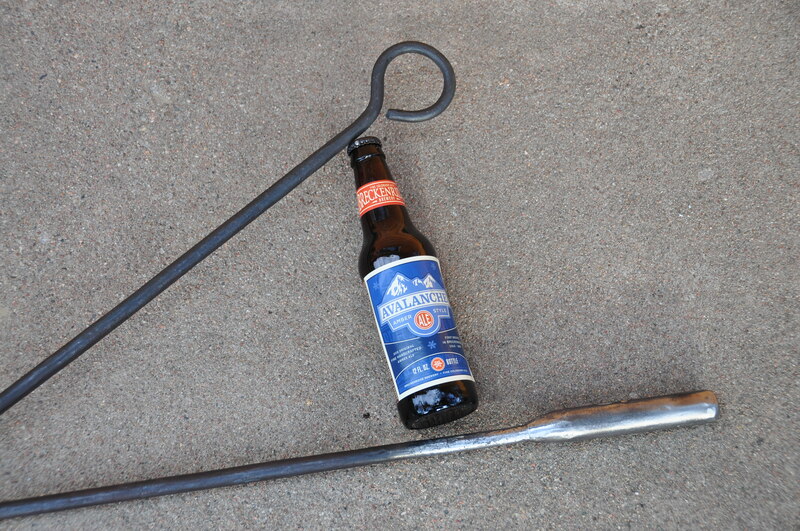 I am pretty sure the old timers would have used a shorter section of the 1″ bar with a short stub drawn out and the 1/2″ handle forge welded on. But, live and learn. My customer gets a great value and I got a great education. I suppose I need to make a shorter one and try the hot toddy or hot buttered rum, but I’ll leave the warm beer for more adventurous types. The claw hammer gives some idea of the size. 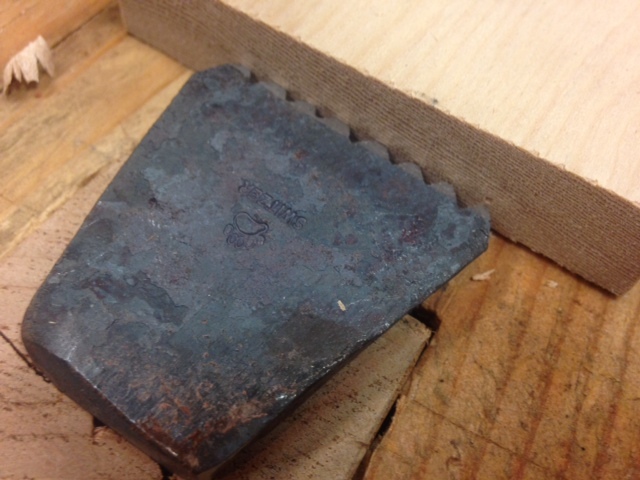 This entry was posted in Blacksmith shop, Custom work and tagged blacksmith, flip iron, hot bear, hot buttered rum, logger head on March 15, 2013 by John Switzer. This entry was posted in Blacksmith shop, Custom work, Hardware on February 13, 2013 by John Switzer. I had never heard the term “chest lift” before. But that is what Megan Fitzpatrick from Popular Woodworking Magazine asked for. Turns out it is just the same as a chest handle. since there is generally a waiting list around here it was going to be awhile before I got the handles done. 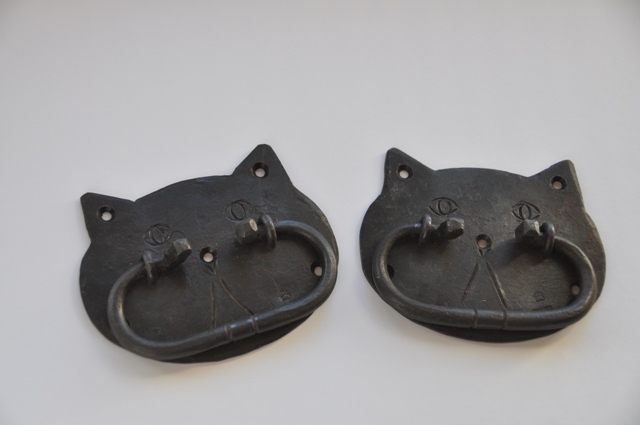 In the meantime Megan posted a blog about her new tool chest she showed some little toggles that hold the hand saws in the till, they are shaped like little cats. 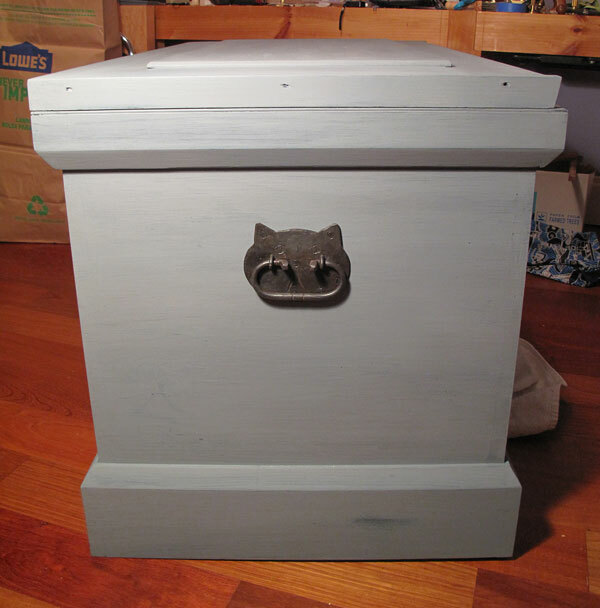 I commented that I could make the handles for the chest look like cats as well. Really I thought she would laugh and write it off as a joke. But she loved the idea. 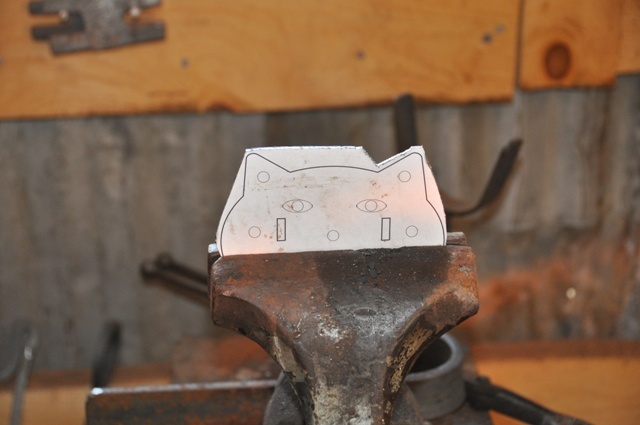 So I have been working on my first ever set of cat shaped tool chest handles. This has really been a fun project and I’m glad Megan liked the idea. The design was drawn up in Correll Draw by Janet (my wife and the head of our quality control department). 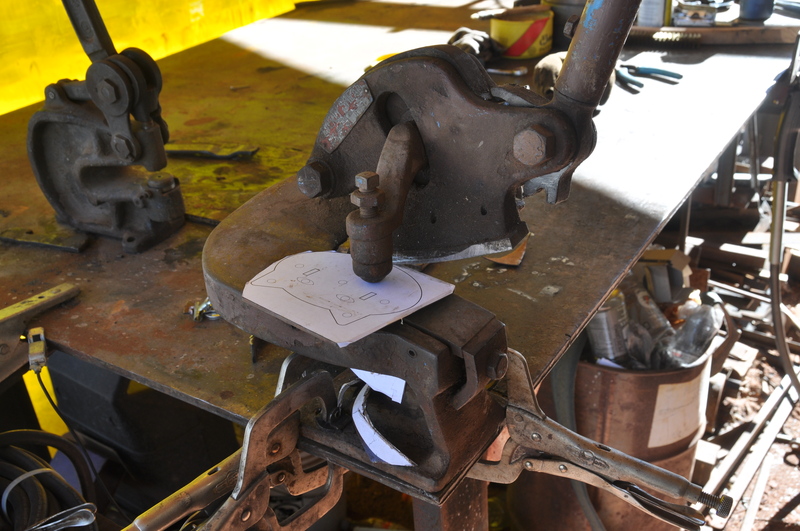 The paper copy is then glued to an 1/8″ piece of steel plate. I cut to the line using a Beverly shear, hacksaw and belt grinder. 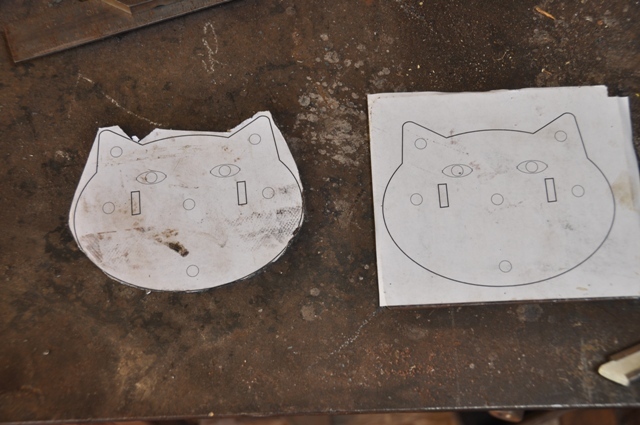 Here is one of the blanks before trimming, the one on the left is ready to grind right down to the line. I wish I had some pictures of the chasing process for the eyes, but I can’t get pictures while working very well. This entry was posted in Blacksmith shop, Custom work, Hardware on February 5, 2013 by John Switzer.